Before our oldest daughter was even born, we bought her books and read them to her. We did and do our best to read to the younger three as well now. It’s nice that the oldest two can read on their own, but even at 9 and 7, they enjoy being read to. The Story [for them] Starts Here [at birth]. 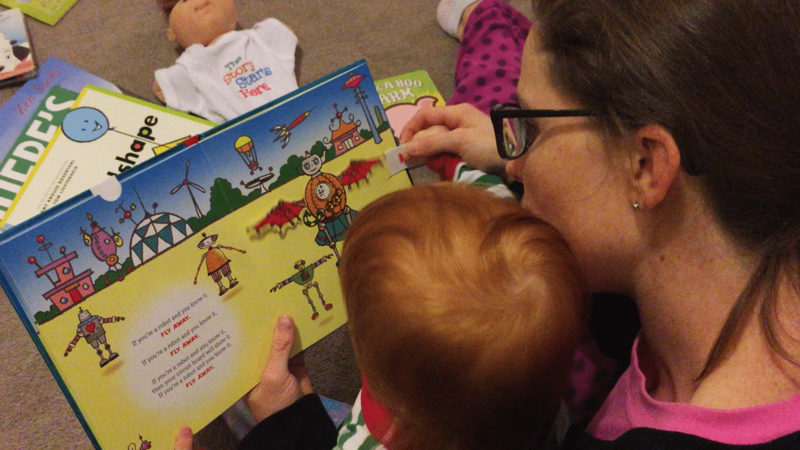 Reading books is so important for babies and toddlers. Well, not them necessarily reading, but being read to. But, it sure is cute when they have a favorite book and they’ve heard it so many times they can “read” it to you! My youngest two still really need board books, especially the youngest. They really like books with animals, textures, repetition and singing. They can “read” these books to themselves while I’m trying to get dinner ready, or we can read them together before bed. Scholastic sent over 5 books for us to check out and If You’re A Robot And You Know It by David A. Carter was an immediate hit. B really liked the sing-song nature of the book (to the tune of the familiar “If you’re happy and you know it”) as the pull-tabs, turn-wheels and more. shoot laser beams out of your eyes! 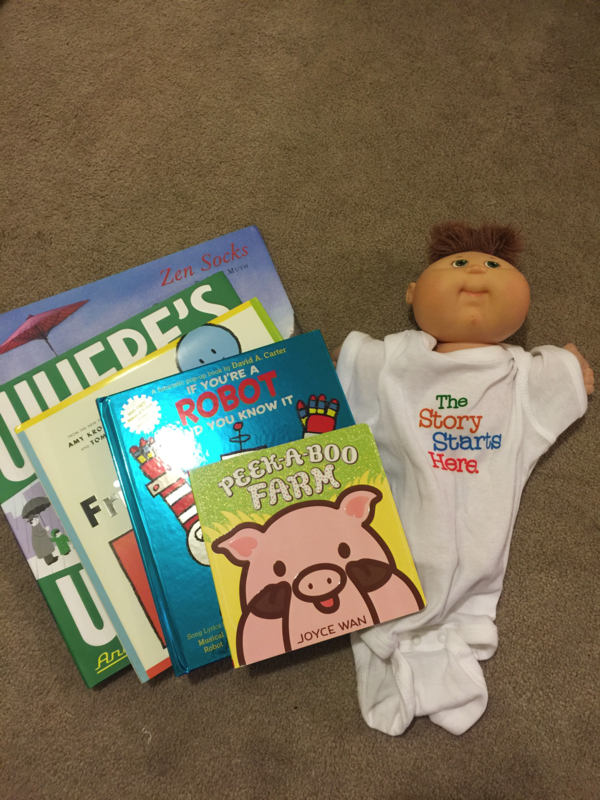 Scholastic has just launched the “The Story Starts Here” campaign which features their books for babies and toddlers. The microsite, as a part of the campaign includes book news, events, information, downloadable assets, activities, author content and more! This new picture book site is set up to extend the reading experience for readers and introduce them to the breadth of Scholastic’s best-selling picture book program. The goal of “The Story Starts Here” is to grow readers from day one! And, we’ve hoped to do just that with our girls! I think my girls read more than I do these days! Check out B getting excited about “If You’re A Robot And You Know It” in this video! In addition to books the microsite also features slideshows of the books, video trailers and activity sheets. If you click this one below, it will take you right to the one you can download for free! 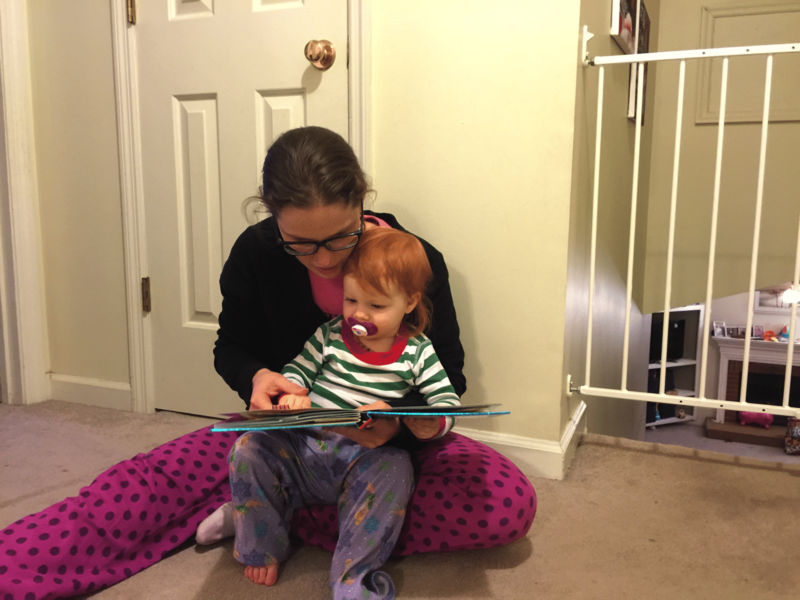 How do you practice good reading habits with your kids? I love Giraffes Can’t Dance! It looks adorable! I love the books I Love You Through and Through and Brown Bear, Brown. The first is super sweet. The latter is just cute. Check out Giraffes Can Dance! It’s adorable and the illustrations are precious. They have a lot of great books to choose from! My grandsons would also enjoy Green Lizards vs. Red Rectangles. My favorite is Goodnight, Goodnight Construction Site because it incorporates my grandson’s favorite thing, construction vehicles, and it gets him in the sleepy mood. B is too cute! 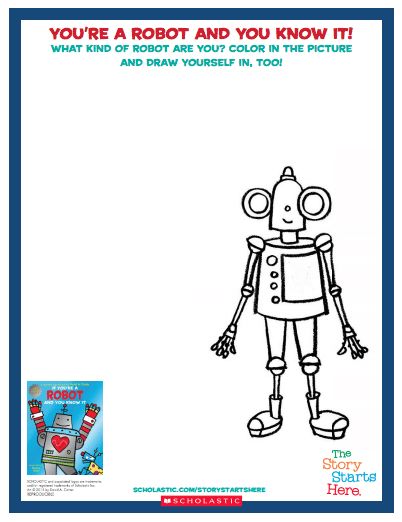 And yay for free printables – I need to print that robot one for my son to color & draw on later. I’d like to read Giraffes Can’t Dance. I actually just searched for it at our library and requested it as it’s on the shelf but at a different branch. Hopefully we can check it out during our visit next week! I loved “Make Way for Ducklings” when I was growing up! “Blueberries for Sal” was also a favorite! Oops, forgot to say why… I remember getting Make Way for Ducklings from the library in audiobook form and we played that tape (yes, I’m old) over and over again! It was so fun to “read” along. I remember looking at the pictures in Blueberries for Sal long before I could read and just overall enjoying the book when my mom would read it! Reading is so big at our house. My daughter is a bookworm and was recently caught in the shower with a book. I like the Klutz books on the Scholastic site, especially the one on Finger Knitting. My daughter LOVES books that are part of a series. For Christmas I purchased her the Anne of Green Gables 8 book set which was a favorite of mine as a child and which I will re-read. I also bought the Little House on the Prairie set for her which I’ve never read and intend to read. Another Scholastic book that I like is The Queen’s Hat. What an impossible question for a book lover! One of my favorite series of books for children is Laura Ingalls Wilder’s Little House books. I read the whole series many times as a child! Those all look so cute. I want to check out Love is Everywhere and Giraffes Can’t Dance! My son is actually enjoying it now. His favorite is a book called Kiki’s Blankie that he received ages ago. Visited the site and I really like NancyDrew and the Clue Crew. My son has been very interested in festive books recently and I noticed the site has some great selections. My children love Jan Brett’s The Mitten because it has beautiful illustrations and a wonderful storyline. I would like Elephant In The Dark! My son loves the Diary of a wipy kid books, he finds them funny and easy to read! Rapunzel is my favorite because she is so pretty and the book is beautifully illustrated. When Sophie’s are Really Really Hurt should be a good one. Thanks for the contest. I think my kids would love Octopuppy! We have A Princess and a Pony and my daughter LOVES it! Right now my kids love The Very Hungry Caterpillar. I think because it’s simple and easy to understand, and memorize. They love the colors as well. I would like to read Bridge to Terabithia again. My favorite children’s book is Strega Nona because my kids loved it and read it over and over. I would like to read Giraffes can’t Dance. It looks really cute. We love, love, LOVE the Fancy Nancy series by Jane O’Conner. She is such a likeable little girl and the illustrations are fantastic! I’d like to read giraffes can’t dance with my son. I would love to get the Star Wars Phonics Box Set for our son. He’s a Star Wars fan & is a reluctant reader. I think it would be fun & helpful! Go Dog Go is a favorite book for both of our boys. It is one of the first books they read independently & they enjoy us reading it to them. I love Scholastic, we order from them often. I think my kids would love “Ten Pigs an Epic Bath Adventure.” They would probably like “Giraffes can’t dance” too. I’m always looking to add books to our collection. I’d like to read When Sophie’s Feelings Are Really, Really Hurt. I love reading the original to my daughter. “The Princess and the Pony” looks a-dor-a-ble! Thanks for the chance to win the awesome prize pack! We love books in our house! What a great giveaway! I am a social worker and am drawn to books about feelings and character. I would love to get the book “When Sophie’s feelings are REally, Really Hurt”. My grandson loves to read. He has the Captain Underpants series on his wish list. My grandson’s favorite book is Scooby DO! Elephant in the Dark looks like a cute one! We are big fans of the llama llama series!! An animal alphabet would be a cute one to read to my son. I like the illustrations for this one. My son loves all of the SkippyJon Jones books because of both the illustrations and the cute story lines. It is a book series that I can read over and over again to him and he still enjoys it! Giraffes Can Dance looks so cute! Im sure my kids would like it! Lets go to the Firehouse looks good! My little ones love dogs so they would enjoy it. The current favorite book at our house is How the Grinch Stole Christmas. They like it because it is about Christmas! I would like to read Love Is Everywhere to my kids. We love to read at bedtime it’s our bedtime routine. My favorite kid’s book was Green Eggs and Ham by Dr. Seuss. I loved all the rhymes he did in all his books. My daughter likes Pinkalicous because her favorite color is pink. Giraffes Can’t Dance looks like a great book. I have heard that it is a good book but haven’t read it before. I would love to get ‘Zen Socks’ for my son and I. He would love a book with pandas in it and it overall seems like a cute book. One of my sons current favorite books is his Lego Batman ‘going bananas” book. Love is Everywhere sounds very cute. My little one likes Goodnight Moon. We read it before bedtime. “The Polar Express”; it is a holiday story with magnificent pictures! The book Love is Everywhere sounds cute. We always read before bedtime. My daughter really likes the books of There Was An Old Lady! My favorite childrens books were from Shel Silverstein. I’m now reading them with my daughter! I would like to get Please Mr Panda book. Seems like a fun book that the kids would like. I wanna get Giraffe’s Can’t Dance for my daughter. She would love it! Wejust got her a Cloud B Giraffe for Christmas. Animal books are my favorite kid’s book because they are too cute! My son loves the “there was an old lady that swallowed..” books. I also like the book Giraffes Can’t Dance. Both my son and daughter love giraffes so they would love this book. My son would love to read Giraffes Can’t Dance. He loves animal story books.